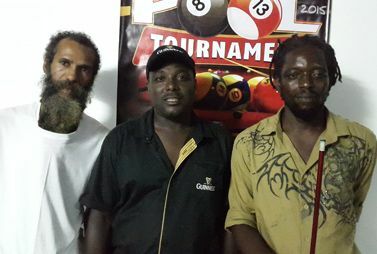 Held at the Drop off Nightclub in San Souci, 26 pool sharks squared off against each other, but when the elimination process was finished, it was Barker and competition favourite Osmond âOzzieâ St Hillaire who ended in the finals. Barker, who had played three other rounds and 12 games of pool, ended up being the overall winner of round one, after he defeated St Hillaire 2-0 and took home the EC$500 prize money. Barker, who has been playing pool for over 30 years, says that he felt âvery goodâ to have won the first leg and earn a spot in the EC$5,000 finals, which will be held at a venue not yet decided. âThis is a very good competition; I think it should be yearly because it is a very good idea and something that will always be good for persons who love playing pool,â said Barker. He added that he is looking forward to playing in the finals. Second placed St Hillaire also praised the Brewery for hosting the tournament and stressed that he will be competing again at another venue, as all entrants are allowed to do so, once they did not win. Meanwhile, Cleve âSkipâ McKenzie, of the St Vincent Breweryâs Trade Marketing Department and tournament supervisor, described the turnout at the first leg as âvery goodâ. âWe are doing this tournament to inject some life back into the pool scene in the country. Tonight showed the excellent skills that our people possess in pool, as all the games were good. We know persons are looking forward to the other games and as you can see from the turnout here things will be very good,â said McKenzie, who also praised the patrons and players at the event for having exceptional conduct. âEveryone had good clean fun and we would like at the other venues for patrons to just come and have fun in a good clean atmosphere. We are looking forward to this,â stressed McKenzie. Meanwhile, persons will take to Nickiâs Bar in Diamond on Friday, January 30 for the second round of competition, while action moves to the Tree House Bar in Arnos Vale this Saturday, January 31, for the third round. Other legs will be held at Nani Billingyâs Bar in Pembroke on February 7, Big City Life Bar in Richland Park on February 13, Aza DaSilvaâs Bar in Troumaca on February 14, West Side Bar in Kingstown on February 17, the Police Canteen in Kingstown on February 20 and in Bequia on February 21. Action kicks off at 8 p.m. on tournament night. The tournament culminates on February 28, after the 10 preliminary rounds. The venue for the finals has not yet been decided. To enter the tournament, persons will have to go to the various venues during game time (8 p.m.) and purchase three Guinness beverages. On purchasing the drinks, you are automatically entered in the round of competition and will play three games against an opponent. The overall winner from that particular venue goes on to the finals, which is scheduled for February 28 at a venue to be determined. The winner in the finals gets EC$5,000, while each preliminary winner gets $500.